WHEN Bobby the lurcher gave chase to an errant squirrel on Hampstead Heath it ended, against the odds, with 45 stitches and a near-death experience for the three-year-old hound. In fact, were it not for the kindness of strangers, says owner Jonathan Fingerhut, Bobby would have bled to death from the appalling injuries he sustained trying to jump the spiked iron railways near Kenwood House a fortnight ago. Fingerhut children Asher, 13, and Nicole, 8, could only watch in ­horror as Kenwood staff and passers-by rushed to help the family pet, hanging by his back legs with a severed artery. A passing jogger took his T-shirt off and wrapped it around the leg to stem the flow of blood. Bobby was rushed to Beaumont Animal Hospital in Royal College Street where doctors spent four hours operating to save his life. 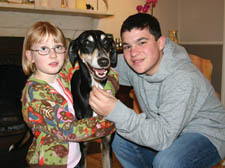 Now Bobby, adopted from Battersea Dogs Home two years ago, is back at home and ­walking again – albeit a little gingerly. “He’s not out of the woods yet but he’s on the mend – he’ll live to chase another squirrel.